Rock art is the predominant and most powerful expression of painting within the Kimberley. It has been constant through time and has not been affected by any cultural changes or almarra1 (white) involvement nor subject to art marketing. Throughout the Northwest and Central Kimberley, painted images abound in rock shelters and cave sites, with the Wanjina being the most spectacular. Wanjina is unique to the Kimberley and in particular to the Worrorra, Ngarinyin and Woonambal peoples who trace their own heritage from the Wanjina spirit ancestors. Mostly, the manifestation of Wanjina art is historic as both the form and imagery have been pre-determined. The owners of these images state that they were not created by the Aboriginal people but inherited from the spirits that left their own images during the Lalai, or Creation period. It is said that the spirit Wanjinas, at the conclusion their earthly activities, laid down in caves or rock shelters to die, leaving their image as a painting. In many cases there are multiple images in the caves or rock shelters and these today are known as picture galleries. These galleries have under gone ritual maintenance by the responsible clans. These picture galleries are sacred and life giving. A. Capell in his book Cave Painting Myths: Northern Kimberley, advises that a member of the Ngarinyin, indicated that Wanjinas are not meant to be depicted alone as this is contrary to Aboriginal life. 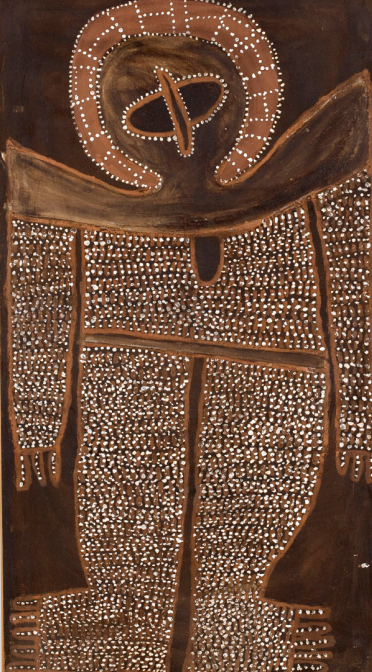 As the Wanjina spirits have considerable power, there is an accepted protocol which Aboriginal people follow when approaching these paintings in order not to offend them. These protocols include calling out to the Wanjina, so that they are warned of the intrusion. It is believed that the Wanjina, if offended, will seek revenge by bringing down the teeming rainstorms to flood the land and drown the people or strike them with lightning. It is believed the Wanjina decreed that prior to the onset of the wet season, the images must be touched up or the painting renewed by ritual leaders. Should this not occur, it would cause drought and hunger for the people. The Wanjina figures are spectacular anthropomorphic figures which can range from three or four metres to less than a metre in length. Often only the heads of the Wanjinas may be depicted. They are mouthless, and invariably shown in frontal view, lying either horizontally or floating vertically on the rock face. It is usual for the Wanjina to be depicted with an elaborate, horseshoe-shaped halo that encloses the head. This is often said to represent clouds, rain and lightning. The figures are painted in red, yellow and black on a dense white background. The painting process involves washing the surface to be painted with water, then the white pigment, usually the mineral huntite, is blown onto the rock or applied by hand. The outline of the Wanjina is then drawn, usually in black and then the features added in red or black. The halo is usually infilled with red ochre, but sometimes yellow pigment is used. This band may include radiating lines representing lightning. The Ngarinyin say that the use of red and white pigments indicate that the bodies of the Wanjinas contain both blood and water. The band around the waist of the full-length figures, which separates the torso from the legs, represents the Wanjina’s hair belt. In some case, the Wanjina features a dark oval shape on the chest, which is considered to be either the sternum or a pearl shell pendant. Often the body of the Wanjina is infilled either with carefully applied rows of large dots or parallel stripes of pigment. These motifs are said to represent falling rain. There are differing accounts as to why the Wanjina are shown without mouth. Different stories relating to specific Wanjinas, account for the variations in Wanjina imagery. It also appears that there are different influences in regard to the imagery from the coastal Wanjina to that of the central Kimberley. 3 Beside Wanjina, paintings adorning the cave walls and overhangs are usually a broad range of other motifs including animals and reptiles from both land and sea, bird life and also botanical themes – edible fruits and roots or tubers, flowers and leaves. 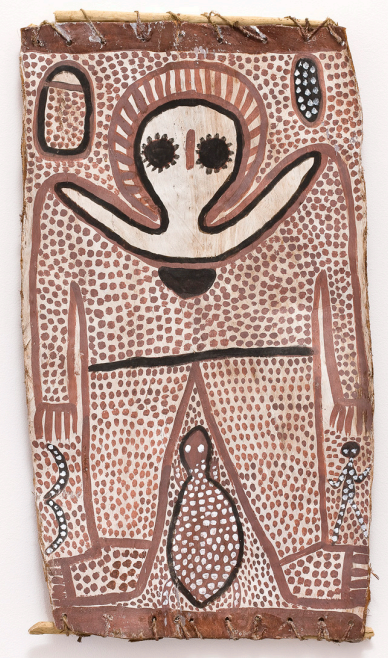 Bark painting appears to have commenced sometime in the early 1930s in the Kimberley region with linguist and anthropologist, Arthur Capell reported watching two Wanjina heads being painted at Walcott Inlet in 1938. Bark appears to have served as the medium to transform depictions of mythology found in the rock art of the region into a marketable form for European consumption. Unlike the more professional approach to the making of art on bark seen in Arnhem Land, the creation of bark painting in the Kimberley was sporadic, and the barks were usually poorly prepared and the ochres applied without the use of a fixative. Very few examples made prior to 1970 have survived. Prior to 1970 the few artists included Wattie Karruwara, a Woonambal man, Charlie Numbulmoore a Ngarinyin man from Gibb River, Alan Mungulu a Worrorra artist, and Mickey Bungkuni also a Ngarinyin man. However from 1970 onwards, barks were produced by David Mowaljarli, Sam Woolagoodja, George Jomeri, Albert Barunga and Cocky Wutjungu, the Karadadas, Alec Minjilmanganu and Manila Kutwit. The creation of Art Centre communities such as Mowanjum and Kalumburu, have inspired many younger people to paint in the Wanjina tradition. Located in the extreme northern aspect of the Kimberley, Kalumburu, a former Benedictine mission, established in 1907, was home to Alec Mingelmanganu, a Woonambal man, whose monumental Wanjina figures are said to have been inspired from a visit to his home in the Lawley River region of the Kimberley. A feature of his work is the exaggerated high pointed shoulders which curve upwards. Mingelmanganu was also one of the first artists to experiment with canvas and his work is easily identified by the sense of proportion of the figures. Other members of the Kalumburu community to also paint include Lily, Rosie, Louis and Jack Karedada and Ignatia Jangarra.